Pay phone kiosks will serve as the hosts of wireless Internet hotspots as part of a new pilot program announced by the city Wednesday. The city’s Department of Information Technology, along with pay phone companies including Van Wagner and Titan, is bringing free public wireless hotspots to pay phone kiosks across the five boroughs. There are currently 10 Wi-Fi locations across Brooklyn, Queens and Manhattan where up to 30 people can log on at the same time. The pay phone companies have monitoring devices at each location to alert them if there is a need to increase the broadband. Each hotspot’s signal is available up to 200 feet away. One woman, who gave her first name as Paula, said the new initiative seemed like a great idea. “It’s convenient, it’s good. You can just walk down the street to be able to just hook up and not feel like you have to go to a Starbucks or a café,” she said. But Candice Morgan, who is visiting New York from Dubai, said she’s concerned about the security of the signal. The city insists the initiative is a public service available free of charge. Currently there are no ads built in or passcodes needed to log on. Officials have put out a request for information asking New Yorkers to submit their feedback on the Wi-Fi initiative and to submit their ideas for the future of the pay phone in New York. The city plans to expand to Staten Island and the Bronx in the coming months if the program is a success. 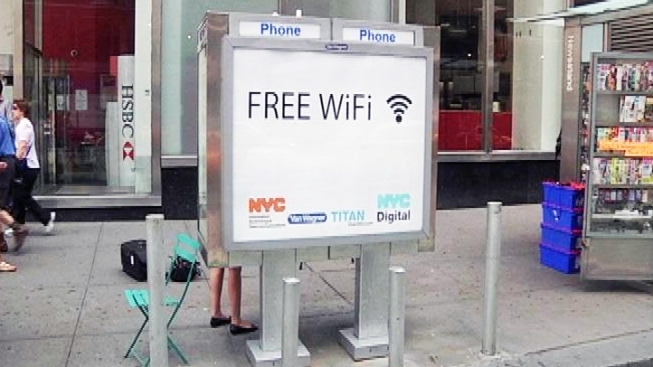 It hopes to eventually expand it to nearly 12,000 kiosks throughout the five boroughs.